When you decide that you want to include voice on your videos, you still have an option to make regarding the use of voice. While some people just want to use their own voice, others may prefer to use computer sound and their voice at the same time. So, here's how to do it using Bandicam. When you want to add your voice to the video, you have two options inside the Bandicam software: you can either use the "Two Sound Mixing" option or not. Make sure to check the option "Two Sound Mixing". Then, you need to go to your system's tray and choose "Recording Devices". A new window will open and you need to make sure that you are under the Recording Tab. Here, you'll need to put the Microphone as the default recording device. Then, click on the Properties button below and click on the Listen tab. Make sure to uncheck the box "Listen to this device" and head to the Levels tab. Here, adjust the volume of the microphone to a value between 70 and 90. - The Secondary Sound Device should be set as Disable. 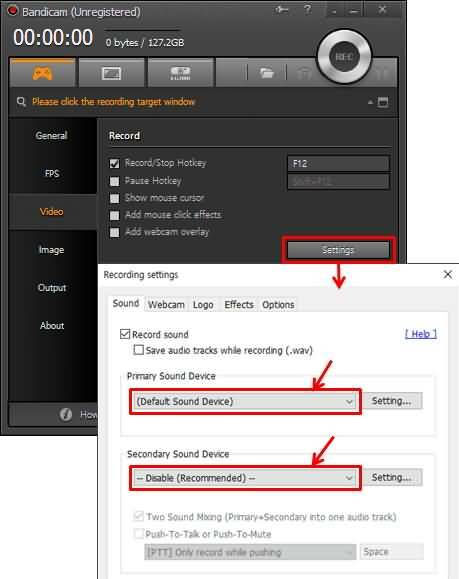 Then, just like before, you need to go to your system's tray and choose "Recording Devices", and on the new window that appears, choose the Recording tab. Make sure that you put the Microphone set as the default device and click on its properties. Under the Listen tab, check the "Listen to this device" and go on to the Levels tab. Here, set the microphone volume between 70 and 90. - Check the "Two Sound Mixing" option. But there are some additional steps here. To make sure that Bandicam is able to record your computer, you need to click on the Settings button on the Bandicam software, and define it just the way you did when you wanted to record your voice when you're not using the "Two Sound Mixing" option. Then, you need to go to your system's tray and choose "Playback Devices". A new window appears and you need to make sure that you're on the "Playback" tab. Here, you need to set the speakers as your default device. Then, go again to the system's tray and, this time, select the "Open Volume Mixer". The volume for the 4 different applications that appear should be between 70% and 90%. One of the problems many people need to deal with when they are trying to record their voice is that, sometimes, the software fails. So, what can you do now? How can you add voice after capture? One of the options that you have is to use Wondershare Filmora to first capture the audio. Just click on the Record tab and select "Record a voiceover". When you're done, you can then replace the original audio of the video. All you need to do is to click on "Import" and this will load both the video and audio files. Just select the video that is in the timeline, right-click and select "Audio Detach". As soon as you get a file with the video and another one with the audio, you can delete the latter. Now, you just need to drag the new audio file you just recorded directly from the Media Library to the timeline's audio track. Another solution that you have is to use Filmora Scrn to record the voice. With Filmora Scrn, you can record your computer audio and microphone at the same time too. One of the most prominent part is that if you can add markers during recording if something goes wrong, like you repeated a script, and find and cut it off easily during editing. Also, you can record your own voiceover after recording during editing, change your audio and video speed or make a quick fade in and fade out effect with just a drag.